Oh my, these two. 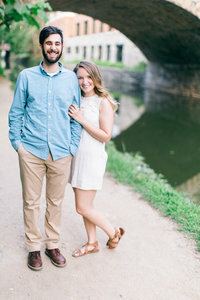 I got to shoot Trever and Megan’s georgetown engagement session a couple of weeks ago and it was SO sweet. Not just because they have such a fun time together, but I would say Megan’s presence in my life during high school made a pretty big mark on me. She was our intern for our youth group before I became a senior, and she had just graduated with a degree in photography. It’s funny how much motivation you can get simply from another person doing something boldly. I realized when applying to college that it wasn’t unrealistic to study art, I mean Megan had done it, right? It’s not crazy? Megan just exudes joy. When I was on staff for my youth group this past year, I remember telling them my top quality for describing a leader was “joy.” Joy unites people more intimately than being the best speaker, or knowing how to execute an event perfectly.